The inspiration for this post is my need to vent about an example of what I view as an absolutely tragic choice by a writer. What follows is an analysis of that choice, which reveals the end of the movie, so if for some odd reason you’re keen on checking out a horror-comedy entitled Undead or Alive: A Zombedy, stop reading now. So, last night I fired up the topic of my discussion on Netflix for some background noise, as is my practice. The concept is simple: zombies in the Old West. Okay, I can get behind this. And it was co-written by Glasgow Phillps, a former staff writer for South Park, which gave me hope this might actually be funny. Not so much, but my gripe isn’t with the forced, flat, and sometimes too-juvenile-for-its-own-good humor, but with the climax of the film. In this setting, the zombie plague is the result of a curse placed on the white man by Geronimo (just roll with it), and the only way to negate the curse is to have to cursed individual consume the flesh of the man who cast the curse — or, lacking that person, a blood relative. 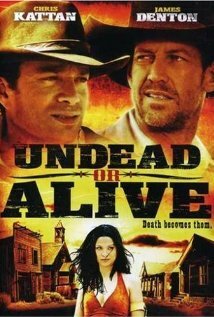 At the end of the movie two of the heroes, Elmer (James Denton) and Luke (Chris Kattan), become infected and turn into zombies, then go after the third protagonist, Susan (Navi Rawat), to satisfy their unholy hunger. They face off. Sue, armed with a cavalry saber and resigned that her former friends are now the undead, charges in, ready to fight. What’s important to note here is that Sue is Geronimo’s niece. Take a guess what happens. If you guessed that the movie jump-cuts to our heroes Elmer and Luke, no longer zombies, sitting atop their horses and lamenting in a very cavalier and off-handed way that it was a shame they had to eat Sue, you’d be right. Up until this point, the story played out very much like any other mismatched buddy adventure with the standard romantic attraction subplot thrown in (between Luke and Sue in this case). Sue was portrayed as far smarter and more competent than her male counterparts, and her motivation was stronger: she was out for vengeance against the Army regiment that slaughtered her people. On the other hand, Elmer was an Army deserter and thief, and Luke was a jilted suitor who threw in with Elmer after the two of them broke out of jail and assaulted the local sheriff. In other words, Sue was a better, more likable, more sympathetic character than the de facto heroes who, in the end, killed and ate her and afterwards acted like it they’d just gotten take-out at McDonald’s. They were even debating good-naturedly what the aftertaste of her flesh reminded them of before literally riding off into the sunset. It was a scene shockingly devoid of emotion. Yes, it was a comedy — and because it was a horror-comedy hybrid, it’s something of a dark comedy by default — but to so callously dispose of a main character like that was a terrible call by Phillips and his co-writer Scott Pourroy. They had many other viable options. Elmer had been infected first, during the obligatory final battle with the zombie horde (a mix of the Army regiment Elmer left and random bad guys) and he had an opportunity to go out a hero. The plan was to blow up the fort and the zombies along with it, and Elmer could have stayed behind to set off the explosives after Luke and Sue escaped. This ending would have brought the character arcs to logical and satisfying conclusions. Elmer, who left the Army because he found its practice of indiscriminately slaughtering Native Americans repugnant, would have enacted revenge against the Army on Sue’s behalf and atoned for his own sins. The milquetoast Luke, who really wanted nothing more than to find love and happiness, would have found it in Sue, who would have laid to rest her all-consuming hatred of the white man. Instead, the writers opted to force a ridiculous and, on many levels, repulsive twist ending, and for what? One last cheap gag that fell on its face? One of the greatest sins any writer can commit is the abandonment of characterization for the sake of forwarding the story, and that sin is amplified when characters who have behaved consistently throughout a story do an abrupt 180 for the sake of a joke. This offense is particularly great in Luke, who wept like a girl whenever he suffered even a mild emotional blow but apparently was very comfortable with cannibalizing a woman he was in love with.